Meet Benh Zeitlin. I always love coming across young up-and-coming filmmakers. In January earlier this year he broke out with a little film called Beasts of the Southern Wild that exploded out of Sundance, with awards and critical praise. The film went on to play at the Cannes Film Festival, where Benh won the Camera d'Or. I saw it at both Sundance and Cannes and fell in love with it (my glowing review), it's one of my favorites of the year as well. I've been anxious to chat with Benh about "Beasts" ever since Sundance and finally got the chance, as Fox Searchlight is debuting Beasts in limited theaters this week. Interview below! Now that we're passed Cannes and Sundance, did you ever expect this kind of response? Did you have any idea it would just take over the world, in a sense? Benh Zeitlin: None whatsoever. Yea, I mean it was never something we even thought about. It was all really focused on… we were just entirely focused on sort of pleasing ourselves, largely. I always am driven by the terror that I'm going to disappoint the people who helped me make the film, so that's always the number one thing that, you know, you try to set out… you start making the film and you tell people: "It's going to be like this, it's going to be like this, it's going to be like this," promise them like, "I'm going to make it good," pour your heart into it. And then that promise kinda is what drives you. We didn't finish the film until two days before Sundance. And the two days in between, I was asleep. So there was no real moment to be like, "Well, if people like it, it will be like this. If people don't, it'll be like this." And then it's just been this kind of nonstop… Since that first moment it's just had this kind of snowball effect. It's been really, really crazy and really amazing, and beautiful. But no, we weren't sitting around making our travel plans. Where did the origin of this idea come from? It's so incredibly original and unique, and I love that idea, so I'm wondering how exactly this story came together? Zeitlin: I think what makes it… there's a lot of different people's creativity intersecting in the film. It started off with me wanting to make a film about holdouts and traveling to the end of the roads in Louisiana; there's sort of five roads that go down into the marsh, and finding this vibrant series of towns, right on the edge of where the land is falling off into the water. So that was kind of the origin, the beginning. But I didn't really have a character story within that. Then, at the same time, I was working on a short about sort of taking my friend Lucy's (Lucy Alibar), the co-writer's play, Juicy and Delicious, and trying to turn that into a short film. At a certain point I realized that the little girl's story of losing a father and the community's story of losing their place had this emotional through-line that was connected and was sort of the same emotion in both stories. And it became my way through the larger—this humongous thing that I wanted to say through this very tiny story that unlocked it in a lot of ways. It was shot down in Louisiana, so how much of the reality of what's there made it into the movie? Did you actually shoot on sets or did it just inspire everything? Zeitlin: Yea, it was all shot on location in these places. Yeah, everything. Which isn't to say we didn't build. It's obviously a heightened reality. It's sort of taking… there's no one place that is "the Bathtub." But the "Bathtub" is made up of all real things. So there's an island with the same geography where it's cut off from the world by the levy, and then you travel down this three mile road and get to this tiny little island of holdouts. And we shot on that island, but it's not like you would drive down that island and think it was the "Bathtub." It's sort of little bits and pieces of things that we then built on top of and things like that. You mean location-wise in the film or? Zeitlin: No, even just culturally, like what people do and how people live and act. It's not a… Those things don't all coexist, but they all exist in the same general region. So it's a concentration and like a heightened sense of reality in that its volume is turned way up, then it's all sort of crunched into this tiny little community. Where do you think your style comes from? Or what specifically makes up your filmmaking sensibilities? I think it comes partially from the culture and the world that you were living in Louisiana, but I'm curious what else? Zeitlin: I mean there's certainly a huge amount. As far as trying to get inspiration for the movie, it's much more about traveling in the world than it is about sitting in a DVD player. And that's not to say that I'm not a movie fanatic. I love movies from the beginning to now in every form. But I try to focus on developing a style that reflects the world that the story is about and trying to make a film by the same principles of the characters that are in the story. And it goes back and forth. These characters who have such tremendous ingenuity and the ability to survive in this fearlessness and perseverance and kind of recklessness. We try to infuse the style and the process of making the film with all those elements. And then probably, at the same time, I want to tell stories about those kind of people because I am that kind of person myself. I think stories aren't personal to my life, so there's kind of a style and a type of person that I'm interested in, and I think it reflects back and forth in the process to the actual film. Certainly there's tons of cinematic influences as well. I think it comes from… I started doing animation and learning from… I've worked with these animators who had worked with Jan Švankmajer, and they sort of had this quality of — where you're going to build this mythological epic story, but you're going to build it all out of bone, and meat, and string, and twine and not fabricate anything. I think building something big out of small parts is something that I've always just been… I've always wanted to be sitting around in my corner building something by hand. So now we're doing that with like 95 people all sitting around in a corner building something by hand and it kinda turns into this big thing. How do you achieve the kind of amazing performances you got out of Quvenzhané Wallis and Dwight Henry? How do you find the person to play that, and then how do you get them to actually give a performance that natural, that real, and that emotionally important? Zeitlin: We searched really hard. We cast really hard. We had tons of people. We looked at 4,000 girls for her part over the course of nine months. I think a big part of it is that there's a really fluidity between the casting and the script. We cast as we write and we modify the script as we cast. So we don't sort of force the people we find into the shell of what's already been created. We really try to find people that somehow speak to… you can find people who can kinda do all the things that the character needs to do and are good at being angry or good at being quiet. Or you can find someone whose heart speaks to the character's heart, even if they don't have any of those qualities, which I think is a more important priority. Then it's about adapting the material to fit their strengths. So we do tons of interviews. Me an Mr. Henry did interviews for a couple of weeks before we even saw the script. Then we started attaching different things from his life to scenes of the film and saying, "How does this scene reflect your experience? Would you do this?" And he would sometimes say, "That makes sense," or sometimes he'd say no and we would change the actions, and then we would change language to fit the way that he would say something as opposed to the way that I would write it. The same things happened with Quvenzhane where I would sit her at the computer, I would sit next to her, and I would say, "Change any words that you don't like," and she would find words she didn't like and change them. So it's just being a little bit more humble to the elements that… And you do that for everything. You do that for locations, you do that for every element. I'm never going to be on screen. So you try to let the elements that are onscreen have agency and let them kind of speak in their own voice while making sure that it stays within the confines of the story you are trying to tell. To wrap up, I want to ask about your collaborative, the collective that made Beasts of the Southern Wild, as I'm curious what exactly Court 13 brought to this and how important they were to making the wonderful film that it is? Zeitlin: I mean, it is kind of an idea, you know. We always talk about, when you cross the start line you live by the code; there's some sort of code that we all have internalized about: it's a very different world that we step into when we're making a film, and it's a very athletic experience, sort of set, where everyone's pushing themselves and we're trying to get the physicality — we're banking on the physicality of the experience finding its way into the film. That we're going to go set a series of challenges before we know how we're going to execute them, but we're going to fall on our swords. We're going to live and die by the sword, essentially. We'll say, "Okay, we're going to have these giant 15 foot creatures in the film, but we're going to say they are going to be live animals. We're not going to create puppets. We're not going to do CG. These have to be living animals. Figure it out." We don't know how we're going to do it. We're going to make a film with a six-year old girl as a star, like no idea if that's even possible. So it's sort of about taking on things that seem impossible as kind of a mandate and kind of infusing all the chaos that comes with working with these elements that you can't control as a sort of task in something that you, as a team, you have all these people chasing these incredibly difficult goals at the same time, and with a lot of agency for everyone. And Court 13 (website) is sort of just a group of people that believes in that as a philosophy of life and art and the ways that those two things mix. Thank you to Fox Searchlight and Benh Zeitlin for the time and opportunity. I've been waiting for this chance to talk with Benh about one of my favorite films of the year ever since Sundance. 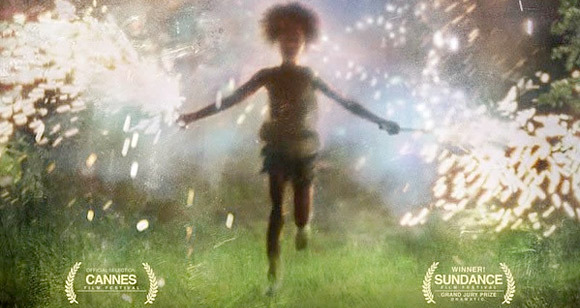 Court 13 & Benh Zeitlin's Beasts of the Southern Wild starts playing in theaters this week. For full theater lists, visit here.